NEWS: 2014 Gartner ECM Review — ViaTRON SYSTEMS, Inc.
Every year Gartner puts out a research paper on the best of the best for ECM (And practically every other industry). 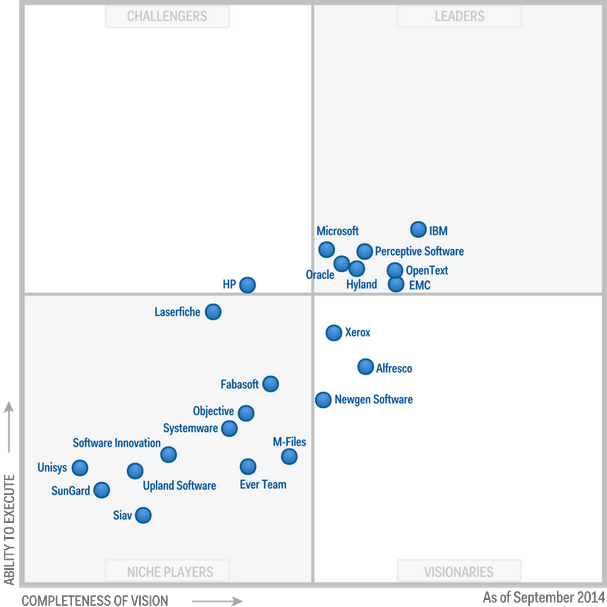 2014 sees much of the same in the leaders from EMC, IBM, Microsoft, Preceptive (Now Lexmark), Hyland and Opentext. The term "enterprise content management" (ECM) describes both a strategic framework and a technical architecture that supports all types of content (and format) throughout the content life cycle. As a strategic framework, ECM can help enterprises take control of their content, and thereby boost productivity, encourage collaboration, help meet compliance initiatives, enable better content-centric processes and make information easier to share. As a technical architecture, ECM consists of a platform or a set of applications that interoperate but that can be sold and used separately.